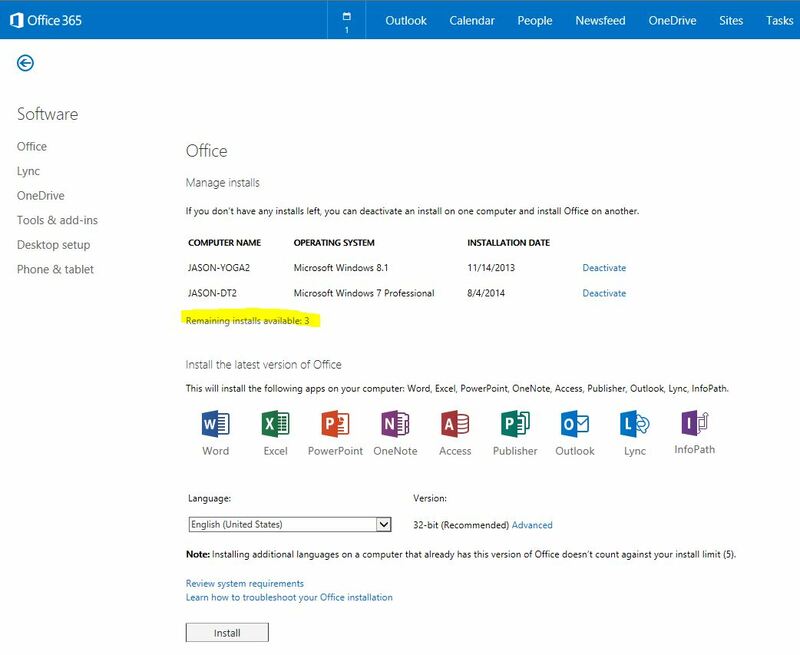 One of the best features of Microsoft’s Office 365 product is that you can install Office 2013 on up to 5 PC’s or Macs PER USER. This subscription based service is a huge departure from the traditional model of buying a boxed copy of Office or buying a license for each computer. The Office installations can also be mixed between multiple work and home computers. This screen show which machines you have Office installed on, the installation date, and how many installs are still available. The plans with Office start at $12.50 per person per month, and include Word, Excel, PowerPoint, OneNote, Access, Publisher, Outlook, and Lync. Of course there are many more benefits to Office 365 for Business besides access to Office 2013, but if you have more than one computer make sure you are taking full advantage of the multiple office installations that are included with your plan.